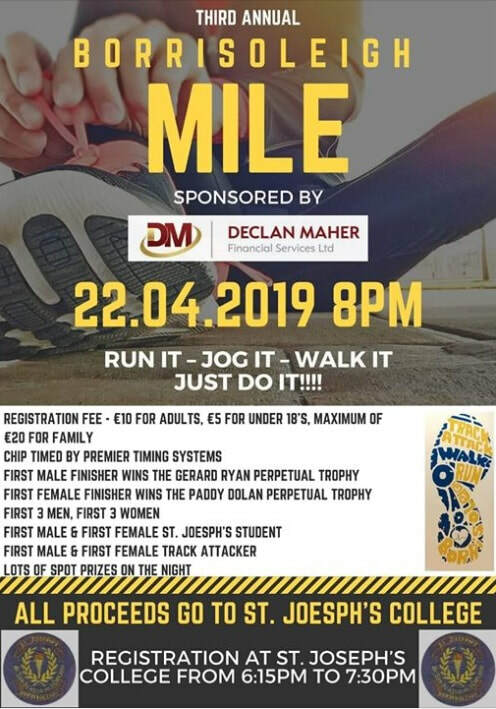 There was a huge turnout in Borris last night where the 3rd annual Borrisoleigh Mile took place. A time of 4:35 saw Crusaders AC athlete Michael Kiely (formerly of Borrisoleigh) win the Gerard Ryan Perpetual Trophy. John Fitzgibbon (Thurles Crokes) took second place in 4:37 with Paddy Cummins (Moycarkey) a further one second behind in third place. Also on the night Sarah Lane of Nenagh Olympic won the Paddy Dolan Perpetual Trophy in a time of 5:04 followed closely by Dundrum’s Dymphna Ryan in 5:08 with another of Nenagh’s top athletes Ailbhe O’Neill in third place in a time of 5:27. A total of 8 athletes broke the 5 minute barrier with 42 in total breaking the 6 minute barrier. Well done to Sarah and to all our club members and support who traveled the short distance to Borrisoleigh. Always a lovely evening and well hosted by the crew from Track attack! The success of a club is not measured by results alone! It can also measured by the enjoyment our athletes have and increasing the number of members actively competing! 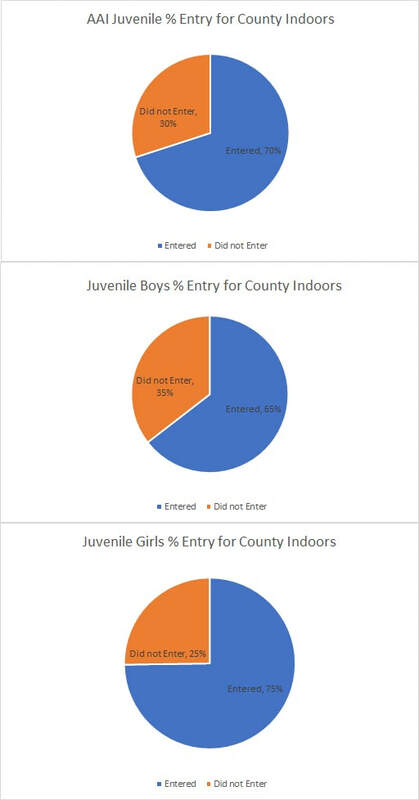 That's 70% of our Juvenile membership (65% of the boys and 75% of the girls). We will start taking your entries at training in the CBS tomorrow evening, Thursday 18th. (Scroll down for more info). 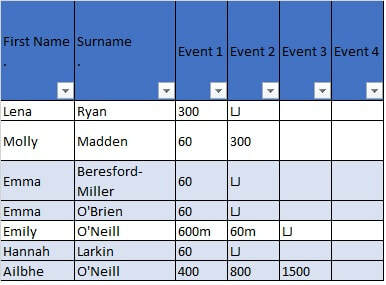 Please select your event(s) from the timetable links below, write them in/on an envelope (include the Athlete's name + Adult contact name & Number), add the entry cost and hand that to a club official or to your coach. Club Officials will be in the CBS on Monday, Wednesday & Thursday nights - starting this Thursday 18th April. If you have questions please speak with your coach. Please send in your entries as soon as possible and this week is preferable. CLOSING DATE FOR ENTRIES IS THURSDAY 2nd MAY. Click the links below to bring you to the timetable of events for each day. We plan on holding competition entry nights as we did for the county indoors. 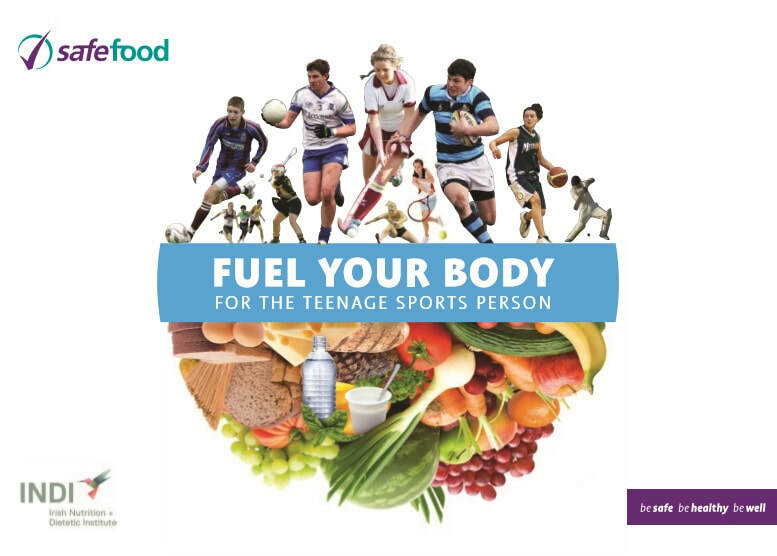 Thanks to LEEVALE AC for the attached guide to healthy eating for teenage athletes. Just click the link below to download. 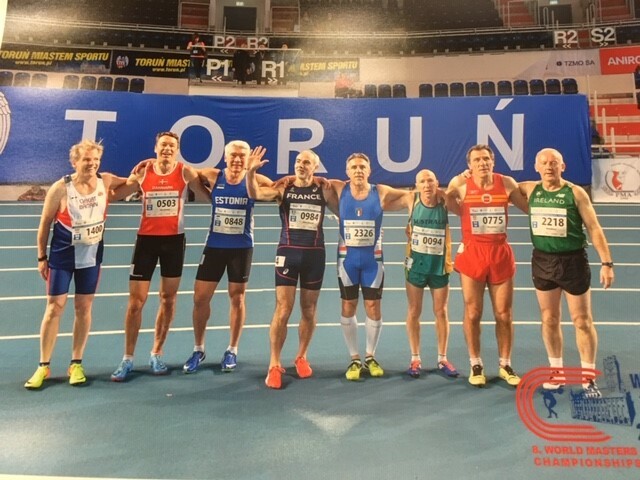 Borrisokane native and Portumna based athlete Niall Kelly (seen here in his Irish Singlet #2218) represented Nenagh Olympic and Ireland at the recently held World Masters Athletic Championships held in Toruń Poland. Niall equaled his seasons best time in the 60m clocking 8.56. He struggled with a tight lane draw in the 200m but came back to run a PB in the 60m Hurdles to place him 16th overall in that event. Joe McEvoy U19 had a great weekend with Gold in the 60mH and silver in the High jump with a great 1.95m clearence. In the same age group Sean Carolan jumped 6.44m to take the bronze in the U19 long jump. Ellen O'Dwyer year continues to go from strength to strength with silver in the U15 high jump with a 1.55m clearance. Another athlete on the rise literally is Jodie McGrath U16 who broke her PB on her way to a 2.90m clearance in the pole vault which was good enough for the silver medal. 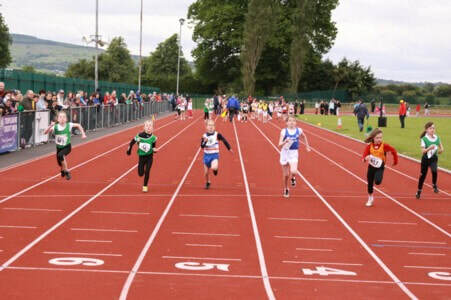 We had a number of athletes who athletes who finished fourth but unluckiest of all was perhaps Ailbhe O'Neill U17 with two fourth place finishes in both the 1500m in 4m51s and 800m in 2m18s. Both were Pb's to set her up nicely for the upcoming outdoor season. Ted Collins U18 was also fourth in his very competitive 800m which was his best result in over 18mths. Ellie McEvoy U15 a sister of the above mentioned Joe was another of our fourth place finishers this time in the U15 high jump in 1.50m. Emma Carolan 7th in her U15 shot, Louis Doyle U17 200m and two young lady's making their debuts at this level of competition were Anna Paxman and Lily Duffy who both ran fantastic in the U12 600m both showing they have a bright future in this sport. We have one more day indoor which will be all the relays in Athlone next Saturday 6th April. Every national vest is special but for Tom Walshe getting his first international call up is something he will remember for the rest of his life. 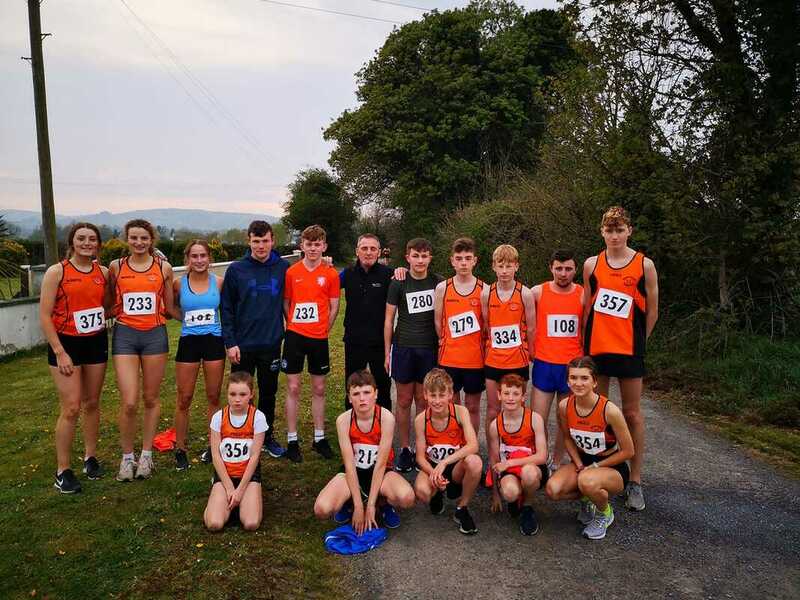 Tom made the Irish Schools cross country team for the SIAB International in Dublin after his great showing in the All Ireland schools in Clongowes two weeks ago. On a beautiful day in Santry Demense Tom finishing in 28th position helped his Irish teammates to the team bronze medals. It was a great day for Tom and his training group who all traveled to support him. 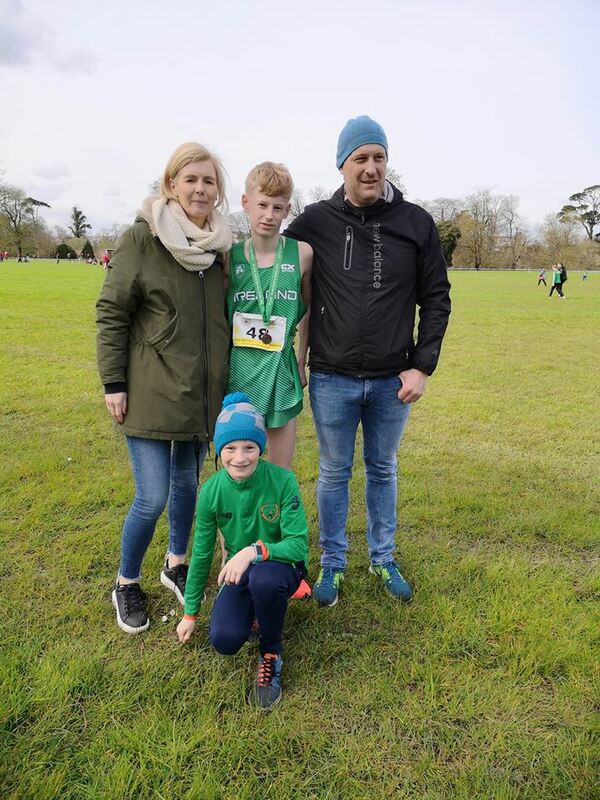 It was a great day for Nenagh CBS who he was representing on the Irish team, his club Nenagh Olympic and it was an especially emotional day for his parents Ronan and Bríd who give Tom and his brothers Ben and Ruairí unconditional love and support in all their sporting endeavors. When your in a sport for a long time especially as a coach one can sometimes forget what brought you into the sport in the first place. And as you and the club in general get more and more successful we can sometimes lose sight of our roots which is why we decided we should put our weight behind supporting our county championships. After all keeping in touch with your roots is what keeps us humble and hard working which are noble qualities in sport as in life. This year because of a major effort by both committee and coaches we had 125 athletes out representing the club from U9 to junior. Going through each athlete individually is not really an option so starting with the U9s here are our medallists and finalists. 1st Molly Madden, 2nd Kate Duffy, 4th Jane O'Rourke & 8th Aisling Ryan. 1st Katie Ryan, 4th Saoirse Ryan. 2nd Naoise Kelly, 4th Lena Ryan, 6th Ines Healy, 7th Juliet Taylor ,9th Sadbh Kennedy. 1st Jane Ó Rourke, 2nd Aisling Ryan 3rd Lucy Anne Cleary, 7th Katie Ryan. 1st Fionn Tucker, 3rd Odhran Cahill, 5th James Hanly. U10 60m Gold Final girls. 5th Saillí Ní Chonchúir, 7th Emma O'Brien. 3rd Emma Lane, 8th Dervla Ryan. 8th Aoibh Cahill, 11th Lauren Cleary. 3rd Róisín Hogan, 4th Pippa McGrath. Boys U10 60m Gold Final. 3rd Cian Ryan, 4th James Dwyer, 5th Paddy McSherry. 60m Silver Final, 3rd Harry Walshe. U10 300, 4th Donncha Brown, 5th Donagh Carmody. 1st James O'Dwyer 2nd Donagh Carmody. 2nd Emily O'Neill, 4th Lilly Marchand, 5th Sarah Long. 2nd Amy Dwyer, 3rd Isobel Coyle. 1st Oscar Griffin, 2nd Adam O'Callaghan, 5th Hugo Healy. 3rd Anna O'Dwyer, 5th Jane Quigley. U12 600m, 5th Sarah Williams, 6th Kara O'Carroll. U12 60m 6th Michael Ryan. U12 Long Jump, 4th Michael Ryan, 7th Jack Quirke Jones. U 13 60m 4th Amy McCarthy, 8th Clodagh Moylan. High Jump 2nd Niamh Boland. 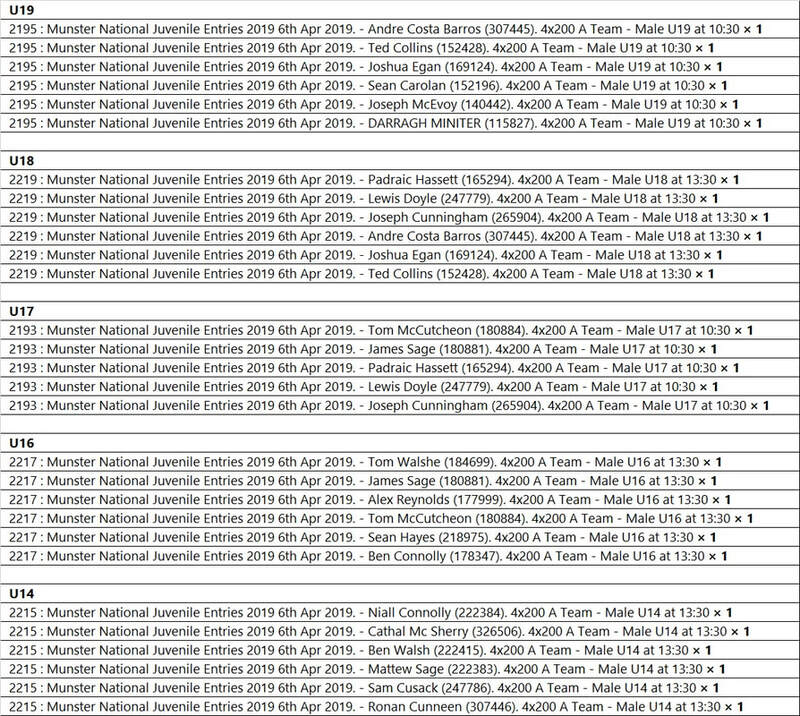 START LIST: Click and download the following file, then scroll down to 'Nenagh Olympic'. Contact Brian on bonirl71@gmail.com by 5pm today, Friday 15th if you spot a mistake. Click here to see the U9 to U12 Indoor Championships Timetable. We recommend you arrive at 9:30. Click here to see the U13 to Junior I Indoor Championships Timetable. We recommend you arrive at 1:30. Allow yourselves time - you may not get parked at the complex. Both Morning and Afternoon sessions are likely to run over - Nenagh Olympic host but do not run the event. Club Singlets should be worn. Relay teams will be decided on the day. MOST IMPORTANTLY ENJOY THE DAY - THIS IS A NO PRESSURE / FUN DAY FOR ALL ATHLETES!